Oregon bigfoot investigator Cliff Barackman recently drove down from Portland to document the site. See his follow-up report on his blog site. Cliff confirmed that the rowers didn't notice the movement on the river bank. 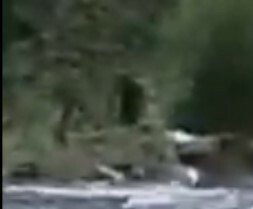 Understandably, they were focused on running the rapids, and the cameraman was focused on keeping the other boat in frame. The location of the incident, and the physical appearance of the figure, and the behavior of the figure are consistent with a sasquatch. Nothing about the figure, or the incident in general, points to a hoax or a case of mistaken identity. The Three Sisters region of Oregon has a long history of sightings and track finds. At first glance the figure appears to be a bit larger than the human in the rowboat, and the figure is certainly not closer to the camera than the rowboat. The behavior of the figure is consistent with a sasquatch. 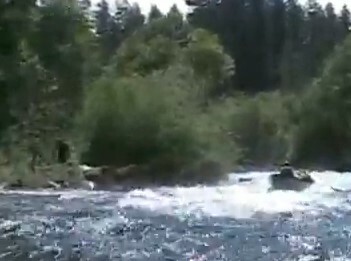 Sasquatches are often spotted near creeks and rivers. Not enough is known about sasquatches to ascertain all the reasons why they would spend a lot of time near creeks and rivers, but a few of the reasons would surely be food-related. There are more protein sources near creeks and rivers -- fish, crayfish (freshwater shrimp), and more insects, amphibians, reptiles, birds, and small mammals (including skunks). Also, in places like the upper McKenzie river, the only dry, non-shady spots to lay in the sun in order to warm up after a cold night of nocturnal stalking ... would be on the rocky/sandy banks of the river. In this type of terrain, where a river or creek is wide enough to be open to the sky, there will be some clean, dry patches of sand and smooth rocks to lay on at various points along the river. Everywhere else, in a densely forested river basin, will be dark and damp and cold and mucky, by comparison. One might assume a river bank would be an undesireable place for a sasquatch to warm up in the sun, because it would be more exposed to humans, but that risk depends on how many humans access the area, and what those humans do there. If the humans occasionally shoot by on the rapids and never stop to get out on the banks, then sunning on the banks presents very little immediate risk -- certainly less risk than being spotted by a motorist on a road.